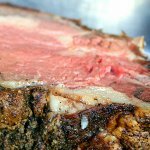 Baked seasoned prime rib would be a great highlight of your meal. If you want something special today, then celebrate National Prime Rib Day, that falls annually on April 27. Prime rib is the finest beef with marbling and a creamy layer of fat. According to the USDA, only about 3 % of beef in America can be graded Prime, that is why it's so hard to find real prime rib in supermarkets. Real prime ribs are generally carried only by the restaurants and finest butchers. USDA Choice, that is lower grade, is usually sold in the supermarkets as prime rib. If you want to cook a prime rib, start with removing the extra fat from the bottom of roast. Combine chopped fresh parsley, rosemary and tarragon 1/2 cup each and add about 1/4 cup of fresh thyme. Season herbs with salt and pepper to your taste and add 1/4 cup of olive oil. Coat the meat with this mixture and bake rib for about 2 1/2 hours at 325 degrees. Let baked rib stand for 10 minutes before serving. Enjoy your meal and celebrate National Prime Rib Day with your family!